More room for workshops and showrooms inside SIKA’s production plant, created with style, personalization and flexibility. The Sika triangle is worldwide known for the innovative chemical solutions applied to the building sector and industry. 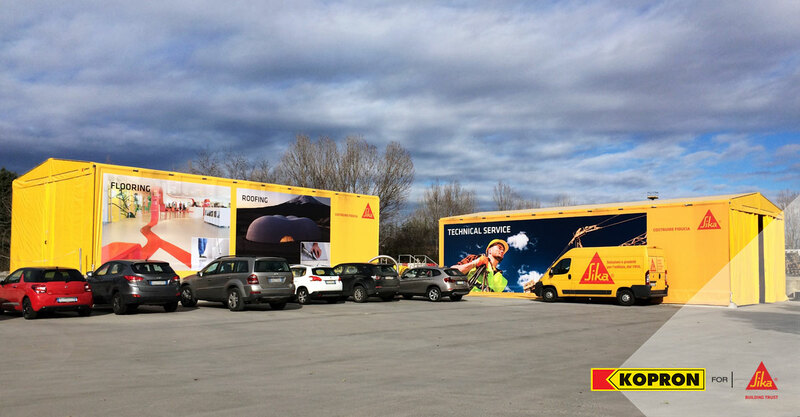 Kopron managed in short time to expand the production area at customer premises at Calusco d’Adda, near Bergamo, and created new space for showrooms and laboratories, thanks to the installation of mobile warehouses in PVC. Kopron fabric PVC warehouses have given the company a further identity, becoming recognizable symbols to customers attending tests carried out inside. The three warehouses in PVC installed are retractable, and measure: 8mt large x 15mt long x 4,5mt tall, covering a total surface of 360mq. 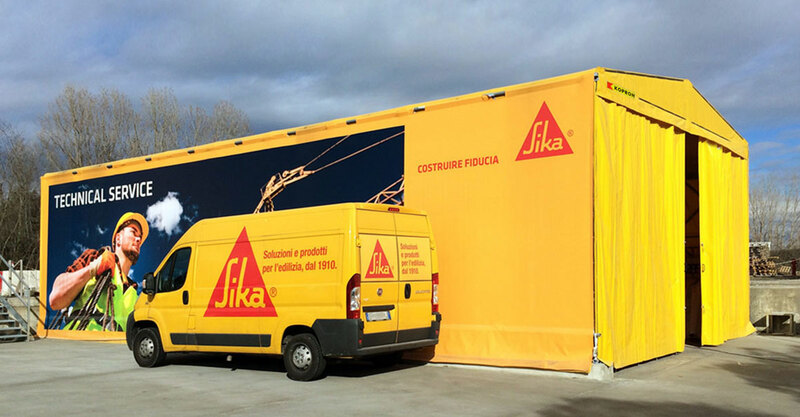 The outside of the warehouse has been designed in order to reproduce the Sika company identity with a yellow fabric and digital printings decorating nearly the whole length of the fabric. The carrying body is in hot-dipped galvanized steel, internally covered with a white fabric in order to avoid reflection and create a clean and neat working environment. Retractable PVC warehouses slide on tracks installed on curbs in concrete. Thanks to the patented wheels which adhere to the tracks with a protective casing preventing damages and derailment, Kopron are able to guarantee absolute safety. Plant production Manager in Sika, Mr Ugo De Tullio chose Kopron without hesitation for the quality of the product and professionalism of personnel. Kopron has been present in the Italian market for 35 years with 3 million square meters covered with their solutions around all Italy. The advantages of these kind of warehouses in steel and fabric, are many in comparison to masonry ones: they have a strong carrying structure but can be expanded, shortened, reused and they are more economical. 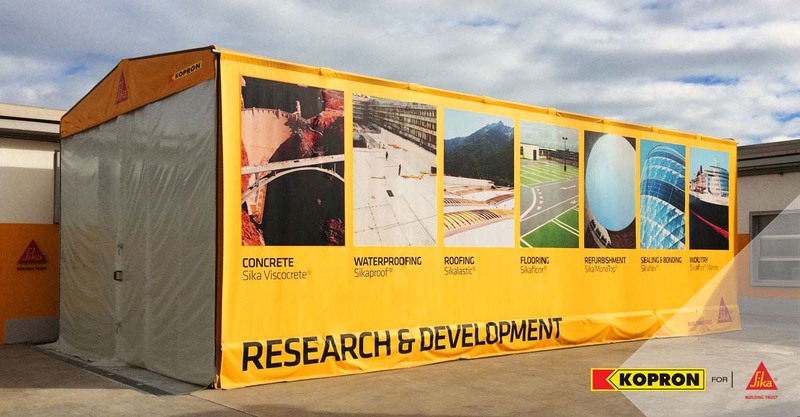 Sika was founded in 1910 by Kaspar Winkler, hired to create waterproofing admixture for mortar to waterproof the Gotthard tunnel for Swiss railway. Today, Sika is known as a leader in chemical solutions applied to the building sector and industry, with 80 national subsidies around the world and 58 productions plants, laboratories for analyses, sales organization and technical assistance. Two multinational leaders together to achieve and consolidate a further company target. Find out more on our logistic solutions!